OK, we’ve got good news and bad news. The bad news is, it might be hot now, but it won’t be long before it is freezing cold outside. And what’s worse, you will have to be out in it working. But here’s the good news: You don’t have to be freezing cold outside while you’re out in it working. That is, if you’re wearing Carhartt boots with LiteFire insulation. LiteFire is a boot liner that is equal to 400 grams of insulation, but feels nothing like it. As in, it feels much, much lighter. You get all kinds of warmth, but without the added bulk. Carhartt is able to do this because LiteFire is a heat-reflective technology. That means it regulates your body’s tempeature by dissipating heat and retaining it depending on your body’s needs. And because LiteFire boots are breathable, it keeps your feet from sweating. Wet feet get cole. So a breathable FireLite liner, of course, keeps them dry. And that, in turn, also keeps them warm. Having a breathable liner is also important because having the ability for air to pass in and out of the boot also enhances heat retention and regulation. Carhartt’s LiteFire liners are also waterproof. Again, if your feet stay dry, they stay warm. So when you’re out trudging around on the frozen tundra, kicking up snow and ice, and standing on the freezing cold ground, LiteFire will keep the elements out and the heat in. You might wonder… if it’s so cold outside that everything is frozen, what difference does it make if it’s waterproof? But the warmth of your feet can melt the snow and ice, and if your boots arent’ waterproof, you’ll find that different firsthand rather quickly. The Fall 2012 line of Carhartt work boots features six different styles: The 6-inch Steel Toe, 8-inch Steel Toe, Steel Toe Wellington Boots, Steel Toe Loggers, Composite Toe Pac Boots, and Composite Toe Met-Guard Mining Boots. 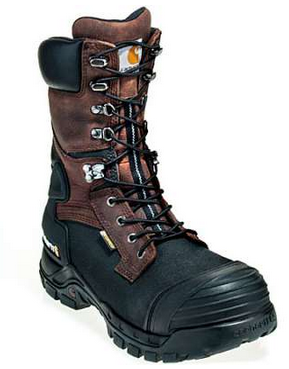 All of these Carhartt boots feature LiteFire Insulation. You will also see additional styles that offer LiteFire insulation from Carhartt. This is nice, because no matter what line of work you’re in, and no matter what you demand from your work boots, Carhartt’s got you covered. Covered from the elements and covered from the cold. Workingperson.com has a wide selection to choose from. Take a visit to Workingperson.com and get yourself equipped for the cold today. Unfortunately, it’ll be here before we know it.